This is the third book in the Coffehouse Mystery series by Cleo Coyle. Her first two books, On What Grounds and Through The Grinder, laid out the basic framework and introduced the reader to the consistent characters in the serie. There is Clare: the shop manager, Matteo: co-shop manager, Clare’s ex-husband, Madame: The owner of The Village Blend, and Matteo’s Mother, Joy: Clare and Matteo’s 20 year old daughter going to Culinary School in Manhattan, Tucker: the overly gay barista, Esther: the moody, typical angsty college student, Detective Quinn: well, he’s the cop most frequently sent to the Village Blend to investigate murders. some of the fashion industries elite members. During one of these parties for accessory design Lottie Harmon, someone poisons a latte meant for Lottie. The drink never makes it to Lottie, instead the drink goes to Tucker’s ex-boyfriend, who ends up dying from the poison. Tucker is arrested on charges of murder, and Clare takes it upon herself to prove Tucker innocent and find out who is meddling with her store’s drinks and killing clients. Reading these books in quick succession really lets me see Coyle’s growth as an author. While the first book was rated, PG-13, this recent one could almost be rated R. The stories and the characters are becoming more complex, and acting more like adults in New York City (ie, cussing, and being abrasive) than they were in the first two books. I actually figured out who the murderer was this time round, but the main clues didn’t confirm my suspisions until the last two chapters of the book. There are lots of twists and turns, and not all of them are that predictable. I like where the series is going, and I’m curious to see what the rest progress. 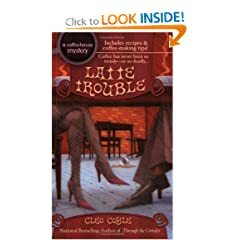 This entry was posted in Adult Fiction, Books and tagged Cleo Coyle, Coffeehouse Mystery, Latte Trouble. Bookmark the permalink.